I have access to a large variety of domestic and exotic woods. With a combination of solid hardwoods and sculptural curved veneers we can create a one of a kind showpiece for your executive office. 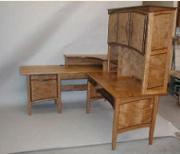 Or the rustic elegance of a redwood burl top executive desk?